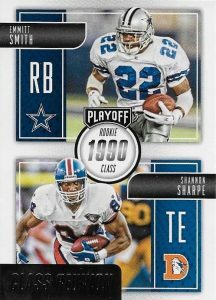 Once a powerhouse that produced many lines now under the Panini banner, 2016 Panini Playoff Football is the start of another run for the popular brand. Collectors can find one autograph and one relic in each hobby box. Featuring vivd images with a nearly-full bleed design, the base set adds a minimal border and centered text box at the bottom of the card. 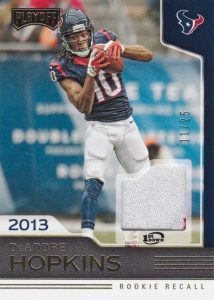 Parallels are numbered to 199 or less and include 4th Down and Touchdown (1/1) for top veterans and rookies. 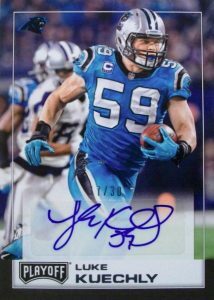 Averaging one per box, signed cards in 2016 Panini Playoff Football include RPS Autographs for the key rookies and Veteran Autographs for the more established names. 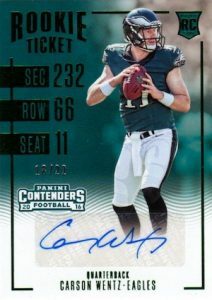 Rolling in another Playoff favorite, Contenders Preview offers the iconic rookie autograph design with a print run of 22 copies. Playoff Pairings Dual Signatures taps directly into the brand name with combo autographs for previous postseason adversaries. Also falling a rate of one per box are memorabilia cards. 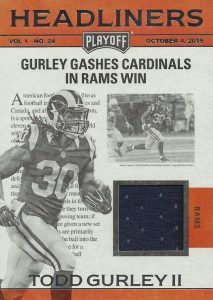 2016 Panini Playoff Football features Headliners, a newspaper-style insert with relic swatches, and Playoff Pairings Memorabilia. Finally, 2016 Panini Playoff Football is rounded out with a mix of inserts that combine with parallels to average two per pack. New designs are found for familiar inserts such as Air Command, Boss Hoggs, and Star Gazing. 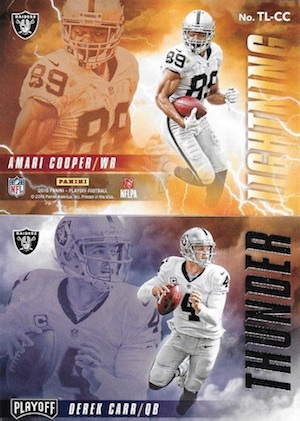 Taking a dual approach are Thunder & Lighting inserts that feature one player on each side of the card. 2016 Panini Playoff Cardale Jones Autograph Card "awesome Card"
PARALLEL CARDS: Goal Line, Kickoff #/199, 1st Down #/99, 2nd Down #/49, 3rd Down #/25, 4th Down #/10, Touchdown 1/1. 40 cards. Serial Numbered #/22. 53 cards. Serial Numbered #/199. *Cards found only in parallels noted below. PARALLEL CARDS: Kickoff #/49, 1st Down #/10, Touchdown 1/1. 49 cards. Serial Numbered #/25. 39 cards. *Cards found only in parallels noted below. PARALLEL CARDS: Kickoff #/49 (*Card #3 - #/25), 1st Down #/10, Touchdown 1/1. PARALLEL CARDS: Kickoff #/199, 1st Down #/99, 2nd Down #/49, 3rd Down #/25, 4th Down #/10, Touchdown 1/1. 15 cards. *Cards found only in parallels noted below. 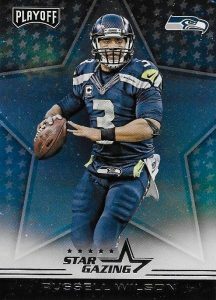 PARALLEL CARDS: Kickoff #/99 or less, Prime 1st Down #/25 or less, Prime Touchdown 1/1. 9 cards. *Cards found only in parallels noted below. 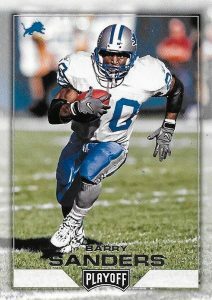 PARALLEL CARDS: Kickoff #/50 or less, Prime 1st Down #/10 (*Card #10 - #/5), Touchdown 1/1. 20 cards. Serial Numbered #/99 (*Card #11 - #/60). 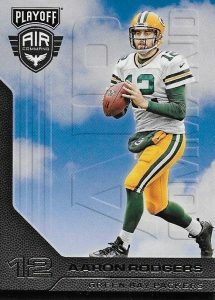 PARALLEL CARDS: Kickoff #/49, Prime 1st Down #/25 or less, Prime Touchdown 1/1. 39 cards. Serial Numbered #/149. PARALLEL CARDS: Kickoff #/49, Prime 1st Down #/25, Prime Touchdown 1/1. 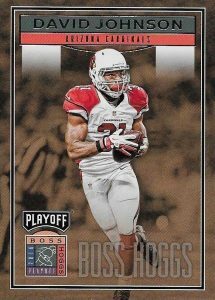 PARALLEL CARDS: Kickoff #/49 (*Card #7 - #/25), Prime 1st Down #/25 or #/10 (*No card #6), Prime Touchdown 1/1. I am not a fan of reviewing products prior to release; without the product in-hand, is such a review fair? Arguably not. My displeasure and 1 Star PREview is predicated upon the total reinvention of an important product…a seminal product…a product that has given birth to some of the most significant rookie cards of the modern era; Tom Brady and Randy Moss, Kurt Warner, Drew Bree’s, LaDainian Tomlinson, Philip Rivers, Ben Roethlisberger, Eli Manning…. I could go on, but I have no need. Collectors know precisely what I am saying….& I am saying, quite clearly, that MANY collectors are fed UP with the manufacturers increasing MSRP (in many instances, quite significantly), slashing product content and hits and for diminished ROI. The disappointing new format for the former flagship product tells collectors all they need to know about the manner in which they are valued. Very solid product!!! Just wish that the autographs could be on-card. Otherwise the rookies hold pretty solid eBay value. Solid product. 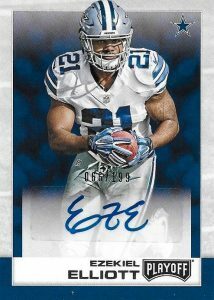 This type of design would be amazing chromed instead of Donruss. As with the majority of Panini products on-card autos would have made this better. 2016 Panini Playoff Football Hobby Box - Factory Sealed!